Ippoliti M, Adams LC, Brenner W, Hamm B, Spincemaille P, Wang Y, Makowski MR. J Magn Reson Imaging 2018; 48: 1410–1420. Bertalan G, Guo J, Tzschätzsch H, Klein C, Barnhill E, Sack I, Braun J. Magn Reson Med 2018; 1–12. Guardiola G, Prezado Y, Roulin C, Bergs J. Clin Transl Rad Oncol 2018; 13: 7-13. Tzschätzsch H, Kreft B, Schrank F, Bergs J, Braun J, and Sack I. Sci Rep 2018; 18(1): 17888. Prezado Y, Jouvion G, Guardiola C, Gonzalez W, Juchaux M, Bergs J, Nauraye C, Labiod D, De Marzi L, Pouzoulet F, Patriarca A, Dendale R. Int J Radiat Oncol Biol Phys. 2019, in press. Riazy L, Schaeffter T, Olbrich M, Schueler J, von Knobelsdorff‐Brenkenhoff F, Niendorf T, Schulz‐Menger J. Magn Reson Med 2019; 1–11. The eBook can be downloaded here and is suitable for most mobile reading devices. The book, edited by Ingolf Sack and Tobias Schaeffter, provides a selection of essential knowledge on the image-based quantification of biophysical parameters for the purpose of clinical diagnosis. 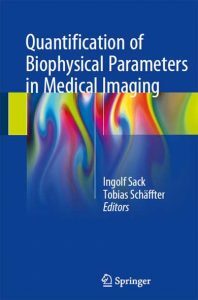 The authors regard clinical imaging scanners as physical measurement systems capable of quantifying intrinsic parameters for depiction of the constitution and biophysical properties of in vivo tissue. On the one hand, this approach supports the development of new methods of imaging highly reproducible, system-independent, and quantitative biomarkers, and these methods receive detailed attention in the book. On the other hand, the reader will also gain a deeper understanding of how physical tissue properties interact with the generation of signals in medical imaging, opening new windows on the intricate and fascinating relationship between the structure and function of living tissues. The book will be of interest to all who recognize the limitations of basing clinical diagnosis primarily on visual inspection of images and who wish to learn more about the diagnostic potential of quantitative and biophysics-based medical imaging markers and the challenges that the paucity of such markers poses for next-generation imaging technologies.